Chapter 9: Event of the Younger Dryas. 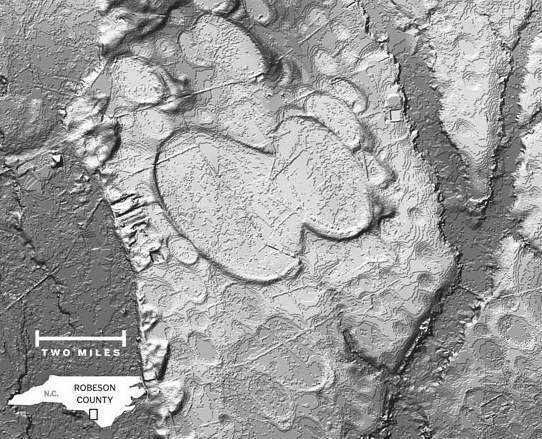 Having introduced some radically different archaeological data for Lower Michigan Clovis spearpoint sites with the 2001 article by Firestone and Topping, the team reinforced itself by adding 23 additional authors, and in 2007 published, "Evidence for an extraterrestrial impact 12,900 years ago [10,900 BC] that contributed to the megafaunal extinctions and the Younger Dryas cooling." The effect -- many authors, many disciplines -- was a bombshell, despite the terseness of the paper. The demise of the Laurentide Ice Sheet, as presented here, will follow the research and published paper of Richard Firestone and 24 other authors, presented in 2007. Although very brief, this paper will invoke the Tunguska event as a model; I will invoke interplanetary electric phenomena. The results are almost the same and indistinguishable, except for a matter of scale. And, of course, I will also hold that the 1500 years of extreme cold of the Younger Dryas was the direct result of a darkness caused by the soot of the continental fires which drifted into the stratosphere and blocked sunlight. Firestone, et alii, will waffle, blaming the cold of the Younger Dryas at some point to the traditional theory of a "shutdown" of the Gulf Stream, as well as the stratospheric soot which blocked sunlight from reaching the surface of the Earth, but with much less emphasis on the last, with the weasel words of "these mechanisms tend to be short-lived". So, although an absolutely overwhelming catastrophe is proposed, completely obliterating all life in North America (no humans are seen in North America for the next 1000 years) and affecting almost all of the Earth, the description of damages is seriously curbed. Placing blame with the Gulf Stream "shutdown" is a throwaway comment, as I have pointed out in the previous chapter. Only in a few instances do the authors suggest the absolutely tremendous magnitude of this catastrophe. I will do better and propose forces large enough to have shoved the Rocky Mountains off the nearby central plains. This last item is a substantial difference between my suggested course of events and the geological analysis by Firestone, et alii. I have little trouble with their archaeological, chemical, and radiological analysis, except in the insistence by the researchers on intergalactic sources. The effects of the strange event at the start of the Younger Dryas are certainly within the range of expected phenomena due to an electric field interaction. The difference is primarily in the causes, but I can also much more clearly match the expected results with the scope of the data, and do so without engaging in ad-hoc qualifications to a basic and sound theory. I am using a predictable interaction between two planets when their plasmaspheres touch. It is a model developed in some detail in the 1970s, based on plasma theory developed in the early and mid-20th century, which in turn derives from the electric field theory of classical physics of the 19th century. All of the theory is still in active use today. On the other hand, the work of Firestone, et alii, is awash in doubt when it comes to causes. This is especially to be seen in the book by Firestone, Allen West, and Simon Warwick-Smith, The Cycle of Cosmic Catastrophes, published in 2006. Nothing fits properly, so that there are claims to a strange collection of imagined causes. These include, starting from the initial suggestion of a neutron bombardment (2001), the following: a nearby supernova of some star (2001 and 2006), a coronal mass ejection by the Sun (2003), a comet or series of comets of unusual composition, which have included "burned out" comets, frozen dustballs "fluffier than snow," and meteors composed largely of carbon or of glass (variously in 2006 and 2007). In each case an incoming bolide explodes high above the Laurentide Ice Sheet and the Great Lakes, and perhaps penetrates the Laurentide in the Hudson Bay region. Meanwhile, Lower Michigan turns radioactive (as detailed in the previous chapter), as happened also to the six-inch-thick layer of black algae which seems to have covered North America almost from end to end after the start of the Younger Dryas. The data certainly cannot be ignored, and much of the processes resulting in these data, as laid out by Firestone, et alii, are certainly expected to be correct, but the ultimate causes are not, especially when they are based on the analogy of Tunguska, which is hardly properly understood today, even after the hundreds of Russian investigations. I will claim, for the start of the Younger Dryas, a very simple electric field interaction with one of the planets below Saturn. The establishment researchers claim rather a "very unusual comet" (their words) which exploded in an air blast and left no mark except for dropping tiny diamonds (nanodiamonds), magnetic iron pellets, fullerenes (buckyballs, mostly of Carbon-60), and carbon glass (Carbon-Oxygen forms). Almost all of these forms might be produced with the stupendous electric field compressive impact over a very large area, and the resultant flash of stupendous heat. But all of these molecular forms are perhaps easier created by massive electric arcs although for some of the data (particles or chemistry) I may have to invoke an atmospheric transfer from the Saturnian planet via its double layer. "A carbon-rich black layer, dating to 12.9 thousand years ago, has been previously identified at 50 Clovis-age sites across North America and appears contemporaneous with the abrupt onset of Younger Dryas cooling. The in-situ bones of extinct Pleistocene megafauna, along with Clovis tool assemblages, occur below this black layer but not within or above it." "In this paper, we provide evidence for an extra-terrestrial impact event at 12.9 thousand years ago, which we hypothesize caused abrupt environmental changes that contributed to Younger Dryas cooling, major ecological reorganization, broad-scale extinctions, and rapid human behavioral shifts at the end of the Clovis Period." I'll take a check on the "human behavioral shifts." I would think that any human who witnessed the "crushing impact" would be dead, incinerated, and reduced to a vapor. In fact, the archaeological record draws a complete blank for all of North America for the next thousand years after this date. Humans came back, apparently from Central America and the Caribbean where they survived, and first show up in the Southern United States after about 600 years. They returned with a spear blade technology known as the "Folsom" point -- smaller, but based on the earlier large fluted "Clovis" points. This is the behavioral shift. The really large and sharp detachable Clovis points were no longer needed; big animals everywhere had disappeared. The smaller Mexican buffalo had started to migrate up into the North American grasslands. The second point made by this paragraph, "changes that contributed to Younger Dryas cooling," I would also take exception to, especially in the light of the 2010 article in Scientific American by Alan Bobock and Brian Toon, "Local Nuclear War, Global Suffering," discussed in the previous chapter. There can be little question that an "event" which burned down the entire North American continent would have caused a massive downturn in temperature because sunlight was blocked from reaching the surface of the Earth for a very long time. "Clovis-age sites in North America are overlain by a thin, discrete layer with varying peak abundances of (i) magnetic grains with iridium, (ii) magnetic microspherules, (iii) charcoal, (iv) soot, (v) carbon spherules, (vi) glass-like carbon containing nanodiamonds, and (vii) fullerenes with extra-terrestrial helium [within Carbon-60 spheres], all of which are evidence for an extra-terrestrial impact and associated biomass burning at 12.9 thousand years ago." "This layer also extends throughout at least 15 Carolina Bays, which are unique, elliptical depressions, oriented to the northwest across the Atlantic Coastal Plain." "We propose that one or more large, low-density extra-terrestrial objects exploded over northern North America, partially destabilizing the Laurentide Ice Sheet and triggering Younger Dryas cooling." Of course I disagree with the "explosion" of a "low-density" "extra-terrestrial" object, but notice that the effects are almost the same. The exploding object, even if large, would represent a compressive force radiating out from a point source, although rapidly lessening in effect away from the location directly underneath the overhead explosion. Since an aerial detonation is spherical in the distribution of force, the effect will fall off as the square of the distance from the exploding center. The fall-off is very considerable. This fact completely contradicts the data obtained by the Firestone group, but is glossed over. There are serious questions (admitted also by the researchers) of what this "exploding object" would be made of, and how it would blow up. The traditional model (supposedly) for this is the uneven expansion of a rocky object (meteor) as it heats up due to air resistance. But our experience of breakups of meteors is that these happen high up in the stratosphere where there is little air resistance. We seldom hear the sound of meteor explosions. As I have already suggested for Tunguska, the breakup and explosion happened because of the electric stresses at a molecular level experienced as the rocky object entered the Earth's electric field. It exploded electrically. The researchers, perfectly aware of the problems associated with suggesting that a meteor blows up (for whatever reason), have instead selected a "comet" as the incoming object -- as if this would make a difference. This will do as a fantasy object, since we have never seen or experienced a snowball comet entering the Earth's atmosphere. Personally, I simply cannot imagine what would happen to such an object on approaching closer to the Earth, even if there were such things as frosty iceball comets. This is where the researchers fall back on the traditional "air resistance" model. The snowball or iceball will explode, it is insisted upon, because it is being heated up. So the authors proceed with an "icy comet," which is flash-heated so that all the ice or water expands into steam -- suddenly. On expansion the ice or water of the comet turns to steam which takes up 1500 times the volume that the water or ice originally occupied. It might be likened to a steam boiler exploding, without the boiler or the buildup of pressure. It is thus assumed that the "mountain sized" snowball entered the atmosphere at perhaps Mach 25 (7 kilometer/second, 15,000 mph). For an object entering the atmosphere at such a speed, heat is produced by compression of the air and a simultaneous rise in temperature at a shock front directly ahead of the object. The heat is not due to friction, but caused by the compression of atomically disassociated (ionized) air. "An approximate rule-of-thumb used by heat shield designers [of returning satellites] for estimating peak shock layer temperature is to assume the air temperature in kelvin to be equal to the entry speed in meters per second - a mathematical coincidence." At 7 kilometer/second (7000 meter/second), the shock front would develop a temperature of 7000 Kelvin in contact with the leading edge of the mile-wide snowball or iceball. A temperature of 7000 degrees is about what a space entry vehicle experiences at its heat shield. But the maximum entry speed might be as high as 70 kilometer/second, suggesting a temperature of 70,000 Kelvin at the shock front (although such a speed would be very unlikely). The heated air, however, largely slips past the leading side of the incoming mountain of ice, and the temperature of the air or atmosphere past the mountain and in its wake would drop radically. Even if not, would this heated shockwave be enough to have all of the snow or ice change phase to a liquid, and then change phase again to a vapor? This has to be accomplished in only a few seconds. The blazing object at Tunguska was seen for 10 minutes or more. I sort of doubt that. The whole idea of an "explosion" of a lightweight ice or snow comet, even if of absolutely gigantic size and traveling at an astounding speed, is enigmatic. The heat of the air at the shock front mostly bypasses the snowball, just as it does with returning spacecraft. Back to exploding an iceball. Adjustments can be made to the parameters of the imaginary comet -- the size of the incoming object, the speed at which it enters, and the angle at which it enters the atmosphere. The result is that a larger object would represent a larger explosion, a higher incoming speed would increase the shock front temperature but reduce the time to get anything accomplished, but a longer flight path would give more time to melt and vaporize the snow. And then the snow mountain would blow up, causing the blast of the detonation to impinge on the surface of North America. As Firestone, et alii, write, "Such airbursts effectively couple the impactor's kinetic energy with the atmosphere or surface, producing devastating blast waves." That deserves some comment -- to be provided further below. At this point in the paper the authors have invoked Tunguska, suggesting a precedence for the notion of exploding iceballs by analogy to the Tunguska event, where, after 100 years of investigations and research, there is still no agreement on what the object was or what happened to it. "The shock wave, thermal pulse, and event-related environmental effects (e.g., extensive biomass burning and food limitations) contributed to end-Pleistocene megafaunal extinctions and adaptive shifts among PaleoAmericans in North America." I do not doubt the shockwave, the thermal pulse, and the other environmental effects (barring "adaptive shifts"), for all the evidence points to the fact that something like this happened. But that is data. The assignment to an aerial detonation of a giant icy comet as the cause is only sustained by fantasy and is almost completely unlikely, except, of course, that the researchers have no recourse but to use the stock characterizations from the mythology of science. An expanding compressive shock wave of air, which the authors suggest slammed into the Earth's surface in North America, is something different from the shock front which rides with an incoming bolide. The authors therefore elect to represent the event as an explosion, because an explosion, such as due to the rapid oxidation of volatile chemicals -- like dynamite or Hydrogen gas -- produces a traveling wave front which expands outward from the location of the explosion. The resulting expansion is the product of the heat of the chemical reaction. This is called a detonation and consists of a rapidly expanding shell of high-pressure and high-temperature gas. The temperature and pressure of the expanding spherical surface also, I should point out, falls off very rapidly with distance. A massive electric repulsive force has the same effect, and can better explain the burning of the whole continent. A point source, or a source of a limited size, even if miles across, would result in a radial drop-off in effect between "ground zero" and any location further out. That means that whatever the effect would be at one mile from the detonation, the effect would be one fourth at two miles, one ninth at three miles. But the effects will need to be felt well over two thousand miles (3200 km) away from Hudson Bay, even though the effects would be 1/1,000,000th at 1000 miles from ground zero. A compressive electric field force impinging from above, over an area of perhaps 1000 or 2000 miles (3200 km) diameter, has the same results, but to a degree much greater than what can be imagined as resulting from an exploding icy object a mile or even a few miles in diameter. "Directly beneath the black mat, where present, we found a thin, sedimentary layer (usually less than 5 cm) [2 inches] containing high concentrations of magnetic microspherules and grains, nanodiamonds, iridium at above background levels, and fullerenes containing extra-terrestrial helium [Helium-3]. These indicators are associated with charcoal, soot, carbon spherules, and glass-like carbon, all of which suggest intense wildfires." "Most of these markers are associated with previously recorded impacts, but a few are atypical of impact events." "The evidence points to an extra-terrestrial event with continent-wide effects, especially biomass burning, but the size, density, and composition of the impactor are poorly understood. Even so, current data suggest that this impactor was very different from well studied iron, stony, or chondritic impactors." I agree with the obvious evaluation of "continent-wide effects." Has fallout been considered? A fallout of atmospheric dust which settled to a depth of 2 inches over all of North America? Admittedly, that is a lot of dust. "Poorly understood" is shorthand for "we don't know." The authors suggest "most likely a comet," and admit that "the current geologic and geochemical evidence is insufficient to fully understand impact dynamics." It was indeed "very different," something which I will get back to further below, and nothing is known about it -- "insufficient to fully understand." As I started developing the text of this chapter, contrary studies came forward (which I am not quoting here). However, already a number of catastrophists have bought into the concept, and even Clube and Napier have jumped on the bandwagon. My immediate thinking was that any "impact" that could cause 1500 years of cold and darkness would have to be astoundingly large. It would not likely be an oceanic impact, for that would only have put water vapor into the atmosphere (as happened at the Exodus of 1492 BC). And so the orthodox paradigm is established. Hesitant tales involving exploding "ET" objects will continue to be told. If the explosion was due to electric field interactions, then the causes are straightforward and the sequence of events is predictable. What becomes then of the greatest interest here is the data which will explain the darkness. But let me first again provide an overview of how an electric field interaction with another planet would develop, with a few details added. A compressive shock is the first element of the electric contact. It is initiated as soon as the planets sense the nearly equal electric charge of each other within a common plasmasphere. The repulsive electric field force is propagated instantly. The repulsive force of the electric field exceeds the gravitational attractive force by more than a billion times a billion times a billion times a billion (10 to the 39th power). "In 1908, at Tunguska, Siberia, an object less than 150 meters in diameter, either a carbonaceous asteroid or a small, burned-out comet [what on Earth is that? ], produced a less than 15-megaton airburst with an intense fireball (10 exp 7 degrees C [10 million degrees Centigrade]) that scorched about 200 square kilometers of trees and leveled about 2,000 square kilometers of forest, yet produced no crater or shock metamorphism." "A debris shower from a heavily fragmented comet would have produced an airburst barrage that was similar to, although exponentially larger than Tunguska, while causing continent-wide biomass burning and ice-sheet disruption, but again possibly, without typical cratering." I was surprised at the opening phrase (quoted earlier), "would effectively couple the impactor's kinetic energy with the atmosphere or surface," for this statement would not pass a high-school physics exam. But in addition, Tunguska is not a good model; a better model would be the Himalayas and the Tibetan Plateau. The Himalayas at the edge of the northern border of India form a circular arc some 1,600 miles long (2500 km), which has all the looks of the edge of a compression shock area. The Tibetan Plateau is a depression, behind the arc of mountains, which has rebounded to a much higher elevation. Almost exactly the same form can be seen in the North American high plains and the adjacent Rocky Mountains. I will present the Tibetan electric field contact, which happened (I suspect) in the year 2349 BC, in chapter 20, "The Flood of Noah," with the details of the mechanics involved discussed in Appendix B, "Celestial Mechanics," complete with diagrams. The details of the 2349 BC event, and a number of others, were developed long before I took it in mind to look at what all the fuss was concerning the article by Firestone, et alii, about the possible aerial explosion over the Laurentide. The date of the start of the Younger Dryas fit well with a general flight plan which I had already developed for an accidental approach of Earth to Saturn and its planets. The initial admission of Earth to the plasmasphere of Saturn and an electric field contact would have caused a tremendous interaction. The suggestion of an explosion over North America at the start of the Younger Dryas suddenly took on a sensible perspective -- sensible, that is, on my terms, not to the establishment narratives which were developed in total absence of any such notions and are hard and fast linked to fantasies of comet explosions and other articles of faith of mainstream science orthodoxy. As I have noted, this can't be helped for the researchers. They have to conform. I am here invoking a repulsive force, which would result if the two planets were of near equal charge. Saturn would carry a much higher positive charge because it came from beyond the edge of the Solar System. To experience a repulsive force, Earth would also have been positive to a nearly equal degree, which is one possibility, but unlikely. If Earth were negatively charged while meeting up with a positively charged planet, the whole affair should have been limited to an attractive force and an arc between the planets in an attempt at charge equalization. Thus, most likely the repulsive force was caused by Mars located below Saturn. From the looks of the curvature of the Rocky Mountains it would seem that Hudson Bay might indeed have been the geometric center of the initial repulsive shock. The area affected probably had a diameter of 2000 miles. I should point out that the shock wave probably traveled to the west coast of the American continent at a rate of 700 miles per hour (1000 km per hr). The 2000-mile diameter is based on the geometry of other (later) shock impulse areas on Earth, Mercury, and the Moon (which are detailed in later pages, especially Appendix B, "Celestial Mechanics"). We would expect the shock impact area to extend over about 25 to 30 degrees of the circumference of the Earth. The area where the initial shock was felt would thus have been 1700 to 2000 miles in diameter (2700 to 3200 km). The arc of the Rocky Mountains is, in fact, about 1000 to 1200 miles from the center of Hudson Bay -- the "impact" location which has also been suggested by Firestone. A 2000-mile diameter area would have extended the reach of the shock area in the north to the edge of the Arctic Ocean, in the east to the west coast of Greenland, and in the south to below the Great Lakes. The shock would have traveled in all directions around the Earth to meet at the exact opposite location and would have compressed the Earth surface into a ringed pattern. The antipodal location is in the Indian Ocean, however. Otherwise we would have additional proof of the delivery of the shock from a signature antipodal pile-up -- as we have for similar shock locations on both the Moon and Mercury. The first effect of the compressive force would be to push the surface of the Earth down, with the result that the region outside of the 2000-mile diameter area, where the applied force would no longer be vertical, would be pushed up in rebound of the Earth's crust. The central area would thus be expected to be flat and perhaps cracked. It is, in fact, as flat as a pancake, leaving only the earliest geological strata in place on the Canadian Shield. The Canadian Shield is entirely composed of metamorphic rock dating to the Cambrian. Metamorphic rock is defined as altered through great heat and pressure. The eskers and drumlins attest to the edges of the electric field force. The size of the area affected is determined by the addition of the parallel vectors representing the electric field of the external planet, and the spherical electric field of the Earth. This results in a considerable drop-off away from the center area which is facing the externally imposed electric field. The curvature of the Earth thus causes the applied force to change from being perpendicular to the Earth's surface to assuming an angle much lower to the surface. Rock breaks at a sixty-degree angle to an applied impact. Thus at the periphery of the impact region, the forces would act to shear mountains from their base, in effect plowing them ahead of the applied force. The center of the applied compressive force would move in its location because the Earth kept rotating. Additionally, because the impulse of the shock was north of the equator, at first the Earth would tilt away from the source of the external force. Thus, in this case, the center of the location which directly faced the Saturnian planet would move south. The initial shock in 10,900 BC produced twice the torque produced by the much later shock at the Tibetan plateau, at about 35 degrees north latitude. In 10,900 BC the center of the impact area was located much further above the center of Earth, at 60 degrees north latitude. The radius arm of the torque was almost twice as large. The initial shock would have been immediately followed by a gyroscopic reaction torque also applied about the center of the Earth. The gyroscopic reaction would attempt to re-establish equilibrium for the dislocation of the spin axis. For the case of an external torque applied above the Earth's equator (as here), the gyroscopic reaction will start a rotation of the Earth's spin axis in a counterclockwise direction as seen from above the North Pole. Thus the "west" would move to the "east" faster than the normal rotation of the Earth would do. Where the center of the impact would move would also depend on the season, that is, in what direction the Earth's axis initially pointed. Of course we have no record of this, unlike the Himalayan impact (which we happen to know to the calendar day), although the season could reasonably be established from the likely relocation of the center of the impact area and the location of the arc. The center of the impact would move south because the northern hemisphere of the Earth would be shoved away by the exterior force. A gyroscopic reaction torque would respond to this at the same moment, and attempt to rotate the facing Earth surface toward the east in order to cancel the disruption. Thus normally we could expect the impact zone to move south and west. But it mainly moved south. I would suggest that the center of the impact was not the middle of Hudson Bay, but at James Bay, at the south end of Hudson Bay, somewhat east and north. 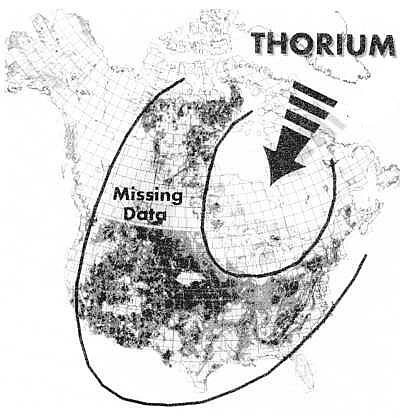 I am basing this on a map of the distribution of Thorium in North America presented in the book by Firestone, West, and Warwick-Smith, The Cycle of Cosmic Catastrophes, published in 2006, and a year before the major paper by Firestone, et alii. The authors Firestone, West, and Warwick-Smith draw an elliptical area as the "Thorium-free zone" as if to suggest an impact area for a bolide angling in from the northeast, but a look at their map projection graphics would instead suggest a circular area on a globe, which would include all of the province of Quebec and Newfoundland. Using a typical map projection results in a distorted surface depiction. The northwest corner of Hudson Bay is within this area, as is the US Midwest through Ohio in a semicircle below the Great Lakes. This central Thorium-free circular area seems like the best location for my proposed compressive force. The center of this is at James Bay at the southern edge of Hudson Bay. This location, as the center of an impact force, is east of most of the Great Lakes, except for the east-most lakes, Erie and Ontario, which are almost directly below James Bay. This circular area with a center at James Bay would solve the problem of having to suggest that the Earth turned a half hour east from the meridian location of the "impact" by virtue of the fact that the position of the Earth's axis of rotation was leaning toward the trailing part of the orbit -- as happens at the spring equinox. If the Earth's axis tilted back from the impact force, it would first bring Lake Ontario into direct line with the exterior planet. Considering what enormous forces were exhibited just in the plowing of the mountains, it can be understood that animals and humans did not survive in most of North America. The sudden compression of the air would have instantaneously raised the temperature by thousands of degrees -- and incinerated everything in a continental conflagration. The fires were confined to the west and south. To the north and east lay the remnant of the Laurentide Ice Sheet. This might have been cracked and compressed and might have been pushed aside -- plowed, like the mountains were. It would have also been affected by the pulse of heat emanating from the center, causing melting of the top surfaces of the glacier. The researchers have given recognition to the heated atmosphere, suggesting a heat impulse with a temperature of 1000 degrees Centigrade -- 1800 degrees Fahrenheit, enough to melt rocks. This, of course, is based on a point source for a compressive shock wave -- an explosion over the Laurentide Ice Sheet. Except in detail, it would be largely indistinguishable from a 2000-mile diameter area of downward directed force, which much better represent the heating, for it was extensively experienced at surface level -- as the data indicates. The blast of compressed air which is suggested to extend from a point source above the Laurentide Ice Sheet would reduce the heat of the compressive impulse in relation to the distance from the center. This would differ from the case under consideration here -- an external electric field compressive force of large diameter. The roll-out of pressure from the very large "impact" zone would be horizontal and of much greater sustained magnitude. The soot fell out of the stratosphere, worldwide, over the next thousand years. It is certain that the soot in the stratosphere not only caused the cooling, but also completed the extinction of much of the North American fauna. There is no need to invoke sudden death due to a wave of extra-terrestrial particles, even if we allow that this, or something like it, happened. The megafauna animals in North America were crushed by the initial compressive force, or instantly obliterated (gasified) by the initial blast of heat of the hurricane winds. The following darkness and the failure of plant growth for a period of 1500 years, or even 1000 years, would remove any of the remaining large animals. "Increasing evidence suggests that the extinction of many mammalian and avian taxa occurred abruptly and perhaps catastrophically at the onset of the Younger Dryas, and this extinction was pronounced in North America where at least 35 mammal genera disappeared, including mammoths, mastodons, ground sloths, horses, and camels, along with birds and smaller mammals." "At Murray Springs, Arizona, a well known Clovis site, mammoth bones and Clovis-age stone tools lie directly beneath the black layer where, as described by Haynes, 'The sudden extinction of the Pleistocene megafauna would be dramatically revealed by explaining that all were gone an instant before the black mat was deposited.'" The extinctions were worldwide. But it was not due to a worldwide influx of neutrons from the far reaches of space or a blast of particles from the Sun. The extinctions, as suggested from the various time delays after the start of the Younger Dryas, were due to the shadow which fell on the Earth, inhibiting plant growth, and starving the larger animals. Before the Younger Dryas came to an end almost all the huge animals disappeared everywhere except in the tropics, far southern South America, and far Northern Asia. Sixty genera disappeared in Asia; and as many in South America -- twice as many as in North America. The researchers hold that the "explosion" above North America was the cause for the rapid melting of the Laurentide glacier covering Canada, the extinction of the megafauna, and the 1500-year period of extremely cold climate. Of these three, the climatological mechanics of how the cold came about -- for a period of 1500 years -- remains unexplained by them. What I have suggested is that the same carbon layer which is found on the ground and dated to the start of the Younger Dryas everywhere in North America also occurred in the atmosphere and would have levitated into the stratosphere -- a lasting shadow descended over North America, and within weeks spread throughout the world. The darkness can be held as true without question. North American Indian tribes uniformly recall the darkness at the beginning of time and the beginning of creation, even though their ancestors had experienced the shadow elsewhere than in North America. And neither had they experienced the blast. But everywhere in the world, in the mythology of people, nothing existed earlier. Dwardu Cardona, in Flare Star (2007), writes, "Myths of the age of darkness surface so often among various Amerind tribes that a complete list would bore the reader to death." Quoting the Yuma, "There was no sun, no moon, no stars -- just darkness." The darkness came at the beginning of all existence, but this was told by people who invaded the North American continent 600 to 1000 years later, for the original North American tribes, like the megafauna, had been obliterated. Cardona also quotes from Maya, Aztec, and Inca sources. They all say the same thing. These myths, in fact, exist throughout the world. But archaeologists, astrophysicists, biologists, and geologists are totally unprepared to deal with so-called "myths" as evidence -- despite the ubiquity of this evidence among our forefathers. "Toon, et alii, suggest that an impact capable of continent-wide damage requires energy of 10 exp 7 megatons equivalent to an impact by a greater than 4-kilometer-wide comet." An object two and a half miles in diameter (4 kilometers wide), larger than most mountains are high, is thus suggested, with an equivalent "impact" energy of 10 exp 7 megatons, which probably is meant to represents its kinetic energy. This is 10,000,000,000 kilotons of TNT, thus equivalent to 600,000,000 atomic bombs. This value is an order of magnitude less than the estimate for the Chicxulub event. Toon, et alii, also suggest that explosions at an "optimal height" would cause damage "over an area the size of North America, that is, equivalent to a ground impact of 10 exp 9 megatons." The value of 10 exp 9 megatons in turn is an order of magnitude greater than the Chicxulub explosion. Thus we could probably assign an explosive value 10 times larger than the Chicxulub explosion. If these values are reasonable, or even of about the same magnitude, then, knowing the ecological damage done worldwide by the Chicxulub "impact," to which is attributed the extinction of the dinosaurs 65 million years ago, we can reflect on the damage that might have been done at the start of the Younger Dryas. The authors shun away from an exact "impact" location, because nothing has been found, yet it would have been of an enormous size (2.5 miles, 4 km, in diameter, they say). There was no impact location. There should be something, perhaps ten times larger in area than the 110-mile (177 km) diameter Chicxulub crater, or at least as large as the 240-mile (400 km) Grand Canyon scar. Firestone suggests the Great Lakes region as the center of the impact, although later in their paper the authors add Hudson Bay. Both apparently are correct. "Just before the beginning of the Younger Dryas cold phase, continuing retreat of the ice sheets and recolonization of vegetation allowed conifer forests to return across the Great Lakes region. ... Alaska remained as Tundra, and areas most recently exposed by the retreating ice were also still Tundra." "The lack of a crater may be due to prior fragmentation of a large impactor, thereby producing multiple airbursts or craters." "These results [unpublished impact experiments by P. H. Schultz, one of the authors] suggest that if multiple 2-kilometer objects struck the 2-kilometer-thick Laurentide Ice Sheet at [an angle] less than 30 degrees, they may have left negligible traces after deglaciation." "Thus, lasting evidence may have been limited to enigmatic depressions or disturbances in the Canadian Shield (e.g., under the Great Lakes or Hudson Bay), while producing marginal or no shock effects and dispersing fine debris composed of the impactor, ice-sheet detritus, and the underlying crust." "... the [clouds] can trigger longer-term consequences through feedback mechanisms. For example, noctilucent clouds can reduce solar insolation at high latitudes, increasing snow accumulation and causing further cooling in a feedback loop." But snow (moisture) is carried by warm air, not by cooler air. Increased glaciation was not experienced at all, anywhere on Earth, during the Younger Dryas. This sort of less-than-thorough analysis causes more enigmas and unresolved questions than are explained. The error, as shown by the Scientific American article by Alan Bobock and Brian Toon, is to think that dust in the stratosphere would be short-lived. Bobock and Toon had conservatively suggested a period of 10 years from firestorms produced by the equivalent of 1500 kilotons of TNT -- 100 Hiroshima-sized atomic bombs. Coauthor to Firestone, O.B. Toon, had conservatively estimated the damage of the event of the Younger Dryas as representing 10,000,000,000 kilotons of TNT -- equivalent to 600,000,000 atomic bombs, and being "short lived." Who are we kidding here? Firestone, et alii, instead place their bets with a 1000-year Atlantic cooling, due to the sudden influx of icebergs from the Laurentide Ice Sheet into the North Atlantic. It is doubtful, however, how much of the Laurentide still existed (this was also suggested earlier by Firestone and Topping). With the onset of the severe cold of the Younger Dryas, further melting of the Laurentide would have abruptly ceased. And sliding glaciers need to melt from the bottom in order to skid into oceans. There are no marks of "Heinrich events" recorded in the Atlantic at this time or later. Heinrich events are the dates for debris layers in the Atlantic attributed to glaciers sliding into the ocean. These suggest major dates for large-scale glacial-melting conditions. The last was 500 years before the onset of the Younger Dryas. In fact, the "collapse of the Gulf Stream," which Firestone invokes under the aegis of North Atlantic glacial influx cooling, is today (and at the time of their paper) more properly dated to about 6200 BC, and lasted a thousand years, thus to 5200 BC. This started 3000 years after the end of the Younger Dryas. This also probably has nothing much to do with a diversion of the Gulf Stream, but more likely represents a large tidal system rotating around Earth in the North Atlantic and North Pacific as Earth started to draw closer to Saturn, but still positioned off center from the south pole of Saturn. It was the nearness of Saturn which caused the new tidal system. This would certainly have disrupted the northern end of the Gulf Stream. A thousand years later (5200 BC) it was over; Earth had repositioned to more or less directly below Saturn, although I have identified this as 5800 BC in later chapters. 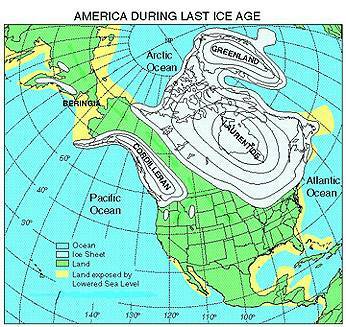 The reason for suggesting Hudson Bay as an alternate to the "ground zero" of the Great Lakes is that the Great Lakes region was not covered by ice at the start of the Younger Dryas (even though depicted as such on most "historical" maps). Yet, as Firestone, et alii, have pointed out, the most likely location of a center of impact is the lower Great Lakes, in that "abundances of microspherules and magnetic grains decrease with increasing distance from the Great Lakes region [meaning Lower Michigan]." From the prospect of an electric interaction, the Great Lakes location was not the impact site -- it was instead the location of a series of anode strikes of planet-to-planet electric thunderbolts. This will be a somewhat later element of the complete interaction. In fact, there is a large plateau running parallel to the Rocky Mountains, called the High Plains, and located nearly a mile (1.5 km) higher than the plain to the east. This is similar in shape and location to the Tibetan Plateau, also adjacent to an arc of shoved-over mountains. I would certainly expect a similar raised plateau east of the Rocky Mountains. 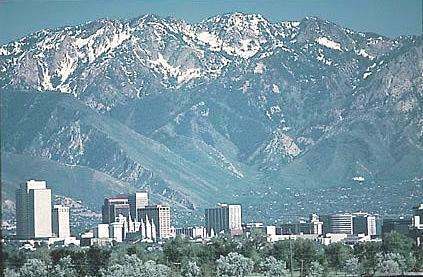 Traveling west from Chicago, you will reach a location where a five- or ten-mile incline takes you up to 6000 feet (2000 meters) above sea level. It is called the High Plains in the USA. The High Plains are much longer in the north-south direction than it is wide in the east-west direction. But it is a mile high, and distinct. The plateau extends from the east part of Colorado, at the base of the Rockies, through Eastern Wyoming, Western Kansas and Nebraska, Eastern Montana adjacent to the Rockies, parts of Western South Dakota and North Dakota, and Alberta province in Canada. The plateau includes, as noted by Wikipedia, buttes and rock outcroppings, as if we are looking at buried mountains, which is how these mountain roots are often represented by geologists. These are the left-behind roots of the Rockies. As the surface of the Earth facing Mars changed polarity through induction to positive, this potential difference, aided by the ionization of the atmosphere due to the heat pulse, would have initiated an attempt at charge equalization. The location to which the center of the "impact area" had shifted would most likely have been the region of the eastern Great Lakes (as I have described). The east-to-west travel of the arc must have been erratic, both at the Great Lakes as at the Grand Canyon. We would expect a general movement of the contact point of the arc to travel south, because the northern hemisphere had been hit, and the northern hemisphere as a result would be tilting away from the location of the contact. Overlaid on this movement would be a travel of the arc to the west, following the turning of the Earth to the east. Unlike the Grand Canyon, which clearly is a cathode mark, the Great Lakes excavations clearly are anode electric arc marks. And they are gigantic! In a dry landscape an incoming lightning bolt would make a neatly carved circular or conical depression, looking like some sort of impact crater of an object headed for Earth on a trajectory perpendicular to the ground. But there is no evidence of meteorite fragments, no shocked quartz. In the wet or frozen environment of the central flatlands of the midwest region of the USA, the results were very much like the depressions and concavities produced at the Tunguska site. Except, of course, that the scope is many orders of magnitude greater. Whereas at Tunguska the holes were 6 to 10 feet (2 to 2.5 meters) in diameter (and 12 to 15 feet deep), and some apparently much larger, the blast holes at the Great Lakes look to be 20 to 30 miles (30 to 50 km) in diameter at the bottom. This is an estimate based on what looks like the diameter of the deepest portions of the five lakes, all of which are nearly circular. To go from an area of a 10 feet diameter circle to the area of a 20 mile diameter circle, means that each of the five blasts at the Great Lakes were individually 100 million times more powerful than at Tunguska. After the furthest east lakes (Ontario or Erie) were struck, the arc would have traveled west, or rather somewhat southwest. South because the northern hemisphere was initially moving away from the direct line of contact, and west because of the rotation of the Earth. After a strike at Lake Erie, the arc seems to have located north to Lake Huron, and then maintained a nearly westerly direction, across Lower Michigan (where there are hundreds of deep conical lakes) and into Lake Michigan, first at the southern lobe, and then north to the Chippewa Basin, before jumping north to Lake Superior. The lineup of locations follows the same general directional changes as the rip of the Grand Canyon. The relocation of the Earth's surface under the external force in this sequence of events can be attributed to the gyroscopic reaction torque. If the gyroscopic reaction increased the rotation of the Earth toward the east by 50 percent, the whole of the arcing would have taken a half hour. The series of electric arc strikes at the Great Lakes suddenly moved inexplicably north from Lake Michigan into Lake Superior. This may represent the moment when the Earth's axis was being uprighted again. The change in forces from repulsive to attractive probably had started to lift the original leaning of the rotational axis away from the external force, so that the "impact center" in effect moved north (the Earth surface at the Great Lakes moved south). Allowing for a time delay due to this second gyroscopic motion, this could represent the relocation of the arc from lower Lake Michigan to Lake Superior. "Usually, around a true impact, we find rocks that are shocked, fractured, and deformed. But we don't think this was a meteorite impact; we think it was a comet impact or bolide explosion." That's just total nonsense, and an attempt to have their cake and eat it too. The Great Lakes are a geological enigma. They are some of the deepest lakes in the world, yet how they were formed has remained completely unknown. 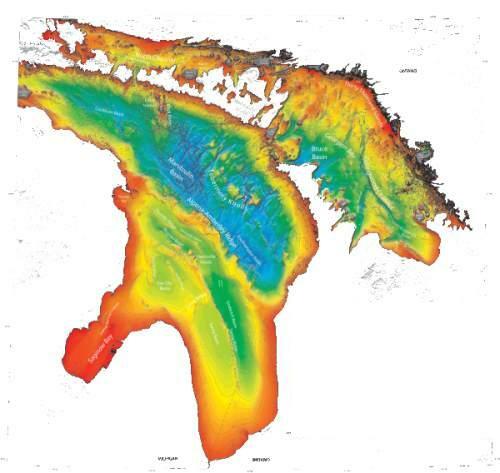 "Submerged arctic currents" of water have been suggested, or that the lakes might follow a natural crack in the crust of the Earth, dating to billions of years ago. It has also been suggested, that the weight of the superimposed Laurentide Ice Sheet pushed into the ground and gouged out the lakes to a depth of 700 to 1300 feet, although glaciers never did that anywhere else in the world over the course of millions of years. What is clear today, and acknowledged, is that there were no Great Lakes "before the end of the Ice Age [about 12,000 BC]." What has not been suggested is that the Great Lakes were created at the very beginning of the Younger Dryas (and thus after "the ice age" by 2000 years) by a series of massive electric arcs, in a matter of a half hour. 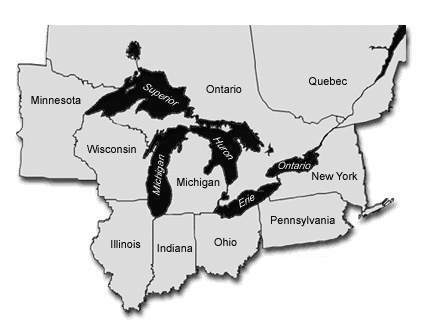 The Great Lakes are big -- the largest set of fresh water lakes in the world -- with lengths of 350 miles (560 km) for Lake Superior, 300 miles (480 km) for Lake Michigan, 240 miles (386 km) for Lake Erie, 200 miles (322 km) for Lake Huron, and 190 miles (300 km) for Lake Ontario. Compare these lengths with the 220-mile (354-km) length of the Grand Canyon. And they are very deep. The Grand Canyon is a mile deep (5000 feet, 1600 m), but the Great Lakes include the deepest lakes in the world (except for Lake Tanganyika, 4800 feet deep, with 4000 feet of muck). Lake Superior is 1300 feet (430 m), Lake Michigan is 920 feet (300 m), and the adjacent Lake Huron is 770 feet (250 m) deep. Lake Erie is only 200 feet (65 m) deep, but Lake Ontario is 800 feet (250 m) deep. Of course other researchers are denying all evidence of an impact at the Great Lakes, and even suggesting that Firestone, et alii, are claiming an impact, even though the paper by Firestone does nothing of the sort and only suggests an above-surface detonation. Perhaps this is the result of cautious language and cagey phrasing, although the concept of an air blast was clearly announced. See postings at [cosmictusk.com] for additional contentious claims and counterclaims. Much of the analysis of the "event" is based on the concept of a singular event, or near identical explosive events contiguous in time. But an electric interaction involves a number of discrete phases, which result in at least two "explosions." The first was represented by the shock of a repulsive impulse. This differs from how the researchers have understood it in being a much larger area -- certainly some 1000 miles in diameter -- rather than a point source. Except for how the shock wave would propagate and how rapidly the effects (like the blast of heated air, the compressive winds) would fall off with distance, the result of the electric interaction and the "exploding 4-kilometer diameter bolide" would match. Except, of course, on a matter of scale. None of the establishment researchers would ever conceive that the forces involved would be so stupendous that the Rocky Mountains would have been shoved off of the high plains of North America, and piled up in the west. Yet the Rockies have all the same fresh looks that the Himalayas have, which are admitted to be recent in their location ("after the last ice age"), and were shoved over to override another set of earlier mountains. For the Himalayas a 300-million-year "subduction" of the Indian subcontinent was earlier used as a suggested mechanism. There is no continental subduction associated with the Rockies. The Laurentide Ice Sheet, which still occupied a portion of the Great Lakes region, also would not have brought the arc to a stopping point; instead the arc seemed to have skipped around. The arc moved from east to west, as the Earth rotated to the east. Rather than moving continuously, like the trail at the Grand Canyon, the arc at the Great Lakes seems to have jumped and restarted with each of the lakes. The deep sections of all five lakes are toward the east end and away from the center of each lake (but north for Lake Michigan). Rather than a continuous moving arc, it looks more like the arc was quenched after each of five or more excavations. The adjacent glacier, melting in the radiation of a multi-billion ampere arc, if not already liquefied by the thermal pulse of the initial shock, perhaps was the cause of that. After each quenching the arc jumped. The path at the Great lakes is as erratic as the lower course of the Grand Canyon, which shows a constant seeking and testing for a conductive path. As the Grand Canyon shows, this has nothing to do with the hardness or durability of the underlying strata. The Grand Canyon cuts through to Precambrian rock. I would expect a similar result at the Great Lakes, although there looks to be a false start at the central portion of Lower Michigan, as I have noted earlier. The general direction of the movement of the series of arcs was from east to west. The land surface of the Great Lakes region might have been higher than today, initially pressed up by the weight of the nearby layer of ice, two miles (3 km) thick. There was a lake, called Lake Chicago, created from melt water runoff from the glacier which occupied what today is the flat area which composes most of the city of Chicago. This should have extended all the way to the state of Michigan, but instead we find the deep southern concavity of the present Lake Michigan. There is the possibility that the holes of the Great Lakes were not made by a single moving arc, but were made by a series of simultaneous or near simultaneous arcs. If I may be allowed to invoke Tunguska (like everyone else does), I could suggest by analogy that the Great Lakes could represent numerous simultaneously created holes and cavities representing only a few thunderclaps. The 2006 book by Firestone, West, and Warwick-Smith reads: "... on the flakes found further away from the Great Lakes, the tracks were at an angle." (pg. 14). They are talking about the tracks of charged particles into chert Clovis spearpoints and the flakes broken from these in sharpening the spearpoints. The difference in angle convinced the authors that this could not be caused by a supernova, for the admission angle in New Mexico should have been only 10 degrees away from nearly vertical. The latitudinal difference between Lower Michigan and New Mexico is 10 degrees (43 degrees and 33 degrees). If Lower Michigan was the epicenter of a supernova blast, then a 10 degrees difference in the angle at which the particles penetrated chert could be attributed to the curvature of the Earth. But apparently the angle was considerably lower than that (closer to the ground). The authors ignore this moment of truth and end up suggesting a supernova anyway. The ground surrounding the contact point of the electric arc would have become highly negative by induction (with the contact point being positive). (Juergens suggested the same differentiation of positive and negative areas for an arc contact on the Moon.) The result would have been the attraction, by the ground surface, of the positively ionized materials being cast up into the atmosphere, or at least a portion of this. Near the arc column these positive materials, after being repelled straight upward but being reversed by their traversal of the surrounding magnetic field, would have ended up expanding away from each other and would likely have traveled up in a spiral. Closer to the ground and closer to the central plasma column the ions would have been spun out at high speeds, directed down toward the ground. The rest of the surface of the Earth would also be negative (but less so), and provide attraction to materials lofted into the atmosphere at an angle. In the 2006 book by Firestone, et alii, it is noted that the entry angles for particles which embedded themselves in Clovis spearpoints (chert) in Michigan suggested a straight down trajectory, whereas locations further away from Michigan showed progressively shallower entry angles as well as less penetration. But in both cases the penetration had to be caused by travel of these particles at absolutely enormous speeds (an estimated 10,000 kilometers per second). It certainly was not gravity which sped up the particles. This suggested to the researchers that the cause of these penetrations was a point source in Michigan, which, of course, was thought to be an exploding bolide. We can be more specific. First, what is obvious is that because of the enormous arcs at the Great Lakes region, large amounts of small-sized silicate grains would have been created, all positively charged. These would have been repulsed straight up and away from the ground, traveling both inside the column of electrons as well as at the edges and beyond. As Juergens has pointed out (from other sources), the upward directed positive ions would have been forced out of the electron column (the plasma column) by the differential voltage between the center of the column and the outer edges of the plasma. In plasma columns contained in glass tubing, as in a lab, the positive ions end up being dispersed to the walls of the tubing. For the situation of a plasma contact at the Moon, Juergens suggests that the surface of the Moon is the equivalent of the tubing walls, so that positive ions would be dispersed to a wide area. 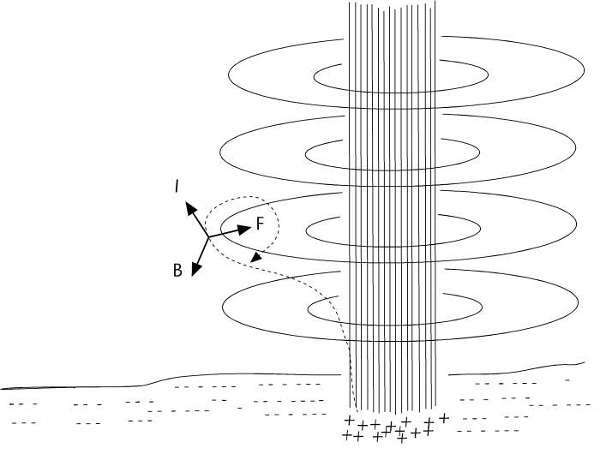 Similarly for the arcs at the Great Lakes, positive ions would have accelerated upward within the electric column of the downward directed electrons, and at some point escaped, and then changed direction due to the circular magnetic field just outside of the column, to eventually be directed both away and upward at increasing speed. The change in direction would be affected by the magnetic field surrounding the plasma stream. The billion-ampere arc would be encircled by an intense magnetic field, as all electric conductors are encircled by magnetic fields. Both the electrons headed for Earth and the positively charged particles moving away constitute a current in the same direction (up, as defined in electric theory). This defines a circular magnetic field in a counterclockwise direction as seen from above. The direction does not matter, what matters is what this field would do to any charged particles lofted into the air from the edges of the arc contact point or which escaped from the plasma column. Particles directed upward outside the plasma column, would be diverted away from the plasma column to travel upward in a spiral. Only at the base of the plasma column would ions be sent to travel toward the Earth, and also the same force would move it away from the plasma column. The rotation of ions in the magnetic field does not change the speed of the particles, but it does radically change the direction of travel. Thus, seen from a direction facing the on-coming "B" vector of the magnetic field, the positively charged particles would be seen to move in a clockwise direction, in large loops. This is the opposite direction from how electrons spiral tightly about magnetic field lines. In traveling away from the plasma column, the attraction of the Earth's negative electric field (including the induced negative polarity) would take over at some distance away from the plasma column. The particles would speed up, accelerated electrically, and head toward the Earth's surface. Particles headed for Earth's surface close to the original plasma arc would be accelerated straight down by the region of high negative charge just outside the plasma stream, and attain phenomenal speeds. This would account for particles deeply bored into chert at the Great Lakes region. The situation outside the arc column is not unlike protons traveling in circles in a cyclotron (also at right angles to a magnetic field), which only gain velocity as an electric field is periodically imposed between the two halves of the cyclotron. This could have been accomplished with fluttering or interruptions of the plasma arc column. We are dealing here with particles which are smaller than the size of sand grains, but constitute clumps of thousands of molecules, and do not carry single electric charges like protons, but multiple positive charges. Protons will not penetrate chert, or much of anything else, even at energy levels of solar protons ("cosmic rays"). Protons also leave almost no record. The charged grains, on the other hand, already accelerated by the electric field outside the plasma column, could be traveling at enormous speeds once they are released to travel toward Earth. Another source for the deflection of charged particles might be the single electric field impulse generated whenever the arc stopped. This would be caused by the sudden drop of current in the column of the arc. The collapse of the magnetic field would cause an electric field to be generated, in a standing formation reaching from the Earth's surface to the ionosphere or beyond, plus a transverse magnetic field in the opposite direction as the circular magnetic field associated with the original plasma column. Together these would move out from the center (where the arc had collapsed) at the speed of light, as a single pulse -- a radio wave, a traveling electric field with a magnetic field at right angles. "The neutrons produced unusually large quantities of Plutonium-239 and substantially altered the natural uranium abundance ratios (Uranium-235 to Uranium-238) in artifacts and in other exposed materials including cherts, sediments, and the entire landscape. These neutrons necessarily transmuted residual nitrogen (Nitrogen-14) in the dated charcoals to radio-carbon [Carbon-14], thus explaining anomalous dates." The culprit here is the neutrons, and their genesis in turn is "cosmic ray interactions." "Cosmic rays" are protons. The generation of neutrons could be explained as the process of inverse beta capture by protons -- that is, the equivalent of the addition of an electron to a proton. This can happen to protons in the nucleus of an atom, but does not generally happen to free protons unless additional energy is supplied. (Protons are Hydrogen atoms stripped of an electron.) But there is a simpler solution than a remote supernova. Firestone and Topping here limit the neutrons as "secondary" and "thermal," that is, neutrons supposedly generated after interactions of protons with other elements and the atmosphere. "Thermal" here means that the neutrons are randomly directed with a range of low speeds. Let me point out that the incoming stream of electrons, which constitutes a plasma flow in Z-pinch constriction, not only produces radiation in x-rays, ultra violet, and visible light, but also produces neutrons. So, for the situation of an immense electric arc, we have the protons, we have the electrons, we have the neutrons, and we have the surplus energy. Where the arc at the start of the Younger Dryas struck, it reduced rocks and soil to the consistency of fine sand and clay-sized silicates with no particular distinguishable features, and sprayed it out into the atmosphere like a lawn sprinkler -- and likely with as much water as sand. If there was a spray to the north, it fell on the glacier. We have no record of that except for the amount of silt left behind after the glacier melted. To the east the spray reached the east coast of the continent and the Atlantic Ocean. North of the states of New Jersey and New York there is no land record; all of the spray might have landed in the Atlantic Ocean. But south of there, and especially in the Carolinas, there is a clear record of oval-shaped depositions of fine sands in sheets 6 feet to 30 feet thick, placed directly on top of older strata, called Carolina Bays. The sand splotches are deposited in three strips near the Atlantic. These are not old strand lines. Further south from Northern Georgia the spray would have fallen on mountains and more rugged terrain. The "Carolina Bay" forms are only occasionally recognized in Florida, Alabama, and Mississippi. The spray shows up again further west in Texas, Kansas, and Nebraska -- a state full of sand anyway (these last locations are identified in the book by Firestone, West, and Warwick-Smith). There are some 500,000 of these. The sand includes no fossils or plant material. It is basically sterile. And on the sand layers there are giant depressed oval forms, so that together the marks look as if giant spheres of wet sand were tossed, looking like paint splatters. These forms are universally known as the Carolina Bays, even when not in North or South Carolina. Three proposed models follow. "Scattered along the eastern coast of the United States from Southern New Jersey to Northern Florida are approximately 500,000 elliptical depressions collectively called the Carolina Bays. The process or processes forming symmetrical, oriented, shallow basins of different sizes has been disputed since the unique character of bay morphology was recognized from aerial photographs during the 1930s." "To date at least sixteen hypotheses involving terrestrial or extraterrestrial processes have been postulated as causal mechanisms. Each theory explains some but not all of the observed morphological and stratigraphic characteristics, and each hypothesis has had varying degrees of acceptance." Eyton and Parkhurst provide details of the Bays: They are oval-shaped ellipses, but not completely symmetrical. The long axis is oriented to the northwest (in the Carolinas), with extensions of the long axes at one time thought to converge in Ohio, but today understood as coming together in Western Illinois and Wisconsin, or in Lake Michigan if allowances are made for the initial speed of the ejecta due to the rotation of the Earth -- as has been pointed out by others (discussed below). Not mentioned or emphasized by Eyton and Parkhurst is that some of the axial directional lines of the more southern Carolina Bays do not meet in Illinois and Wisconsin, but point north instead and could even be extended to Hudson Bay with some graphical fudging (which Firestone, West, and Warwick-Smith do). In actuality, these nonconforming lines simply cross all the other Great Lakes. Carolina Bays in southern South Carolina and Georgia point directly north to Lake Erie and Lake Ontario. No one seems to have noticed the obvious. Eyton and Parkhurst also were unaware of the distinctly shaped Carolina Bays in Nebraska, where the axial line extensions mostly intersect the axial line extensions of the Bays of the Atlantic coast and the Carolinas -- in Central Wisconsin and Northern Illinois. The Bays consist only of shallow depressions, with a surrounding ridge of sand ("elevated sandy rims"), which is almost always somewhat higher in the southeast -- or opposite the direction from which the splashes seem to have arrived. Many Bays overlap others, without destroying the pattern of the initial Bay, a detail which seems to have utterly confounded most of the researchers (including Firestone). But if understood as aerial depositions of wet sand, it will start to make sense. All the Bays thus look equally well preserved, without regard to the age and condition of the substrate -- "equally preserved on terraces of different ages and formational processes." "... the remarkable regularity with which these characteristics recur suggests that further consideration of a unique, causal mechanism is warranted." Eyton and Parkhurst then "speculate" (their wording) about a meteor on a low trajectory coming in from the northwest, and shattering over Indiana and Ohio, to send 500,000 fragments toward the Carolinas, each of which, with an additional explosion above ground, formed a Bay with its individual shockwave. I won't even comment on the unlikeliness of 500,000 "individual shock waves." I think Eyton and Parkhurst go astray with their reliance on the supposition that there is a physical difference between asteroids (known to be rocks), meteors (thought to be rocks), and comets (thought to be snowballs). I would readily entertain their model if I still believed the totally unsubstantiated notion of comets as snowballs, dirty iceballs, or icy dirtballs. The authors also were unaware of other Carolina Bays in Texas and Nebraska (and other locations), where the long axes of the Bays point to the Great Lakes (that is, north and northeast). This largely argues against a meteor on a trajectory from the northwest. Robert Kobres, a researcher in Athens, Georgia, and a promoter of meteor impacts as the cause for all earthly catastrophes, has kept abreast of the Carolina Bays investigations by providing a collection of documents on the web. Kobres himself proposes something similar to the model of Eyton and Parkhurst, shock-induced dents in existing sand dunes. [abob.libs.uga.edu/bobk/firewate.html]. To explain the Bays, Kobres proposes that a comet whipped past the Earth, inexplicably exchanging enormous energy, but not impacting directly to form a typical crater. George Howard (one of the co-authors of the 2007 paper by Firestone, et alii), explains Kobres's model, at [www.georgehoward.net/cbays.htm], as, "It is demonstrable that such an encounter would show [meaning "project"] an intense flash of heat onto the ground below." I wonder how "demonstrable" that concept really is. I think, in fact, that it is not at all demonstrable. It is pure fantasy. It might work for a dropped bomb with a fuse set to explode it 60 feet above the ground, but the overpassing comet needs to clear the Appalachians, and then locate all the sand dunes and beaver ponds. Where did the sand dunes come from if they were clearly not beaches? This heat, writes Kobres, would have caused moist portions in the Pleistocene landscape (preexisting springs, marshes, and beaver ponds) to explode into steam, leaving the depressions in the ground that we know today as "Carolina Bays." Kobres's only explicit reference to Tunguska is to "oval bogs" first noted at Tunguska in 1927 (by L.A. Kulik), but implicit is the notion of a comet approaching at a low angle, and an aerial explosion or at least a change to incandescence -- a snowball in flames. It is, indeed, difficult to imagine anything else than an impact, or, when there is no evidence of an impact, to concoct a damaging non-impact. Meteors or comets will remain in play as long as the massive forces involved in an electric contact with another planet, or the magnitude of the resulting electric arc, remain unimaginable. "A challenging aspect of a Carolina Bay Impact hypothesis involves the lack of an identifiable impact structure." I'll say. That has been the problem for all researchers involved in the event at the beginning of the Younger Dryas. Davias and Gilbride feel that a geological mark of an "explosion" is to be found in the middle of the state of Michigan. But, never mind, what I want to do is to follow up on the more imaginative thinking of Davias and Gilbride. Having thought to have discovered a likely "impact" (or "launch") location, Davias and Gilbride start to calculate trajectories from a middle location of Lower Michigan to the Carolina Bays in North and South Carolina, which last is the most obvious landing place of the mudballs (which is my nomenclature) or paint spatters (which is their nomenclature) flung from Lower Michigan or somewhere thereabouts. Let me first confirm what the reader will have already suspected: that I am in full agreement with the concept developed by Davias and Gilbride that the Carolina Bays, where they are preserved in pristine condition by having landed on a nearly flat surface, obviously are exactly what they call them, "paint spatters." This is so clear and obvious that I am immensely surprised that no one else has noted this. Of course to be able to imagine that large globs of sand and water (at times miles in diameter) flew through the air and landed along the coast of the Carolinas (and many other locations) requires setting aside the prejudices of small scale physics which limit the imagination. But if the creation of the Carolina Bays is associated with the event at the start of the Younger Dryas (although Davias and Gilbride do not think so), then there should be very little question on the magnitude of startling effects. The event preceding the Younger Dryas burned down all of the North American continent in a single moment, as evidenced by the same archaeological "black layer" found everywhere. The other item undertaken by Davias and Gilbride is a correction of the possible trajectories of these mudballs by taking into account the rotation of the Earth (the Coriolis effect) and air resistance. Having some idea for a location of a launch site, estimates were made by Davias and Gilbride of the flight time and from this the angle and speed at which the mudballs would approach the ground. 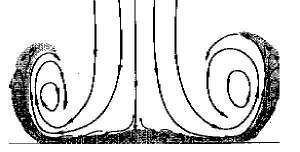 The authors include some graphics on their website of a landing mudball and its deformation. I should explain, however, that the path of the trajectories is a completely open question, except to assume a 45-degree ascending cannonball trajectory. The path of the mudballs through the air simply cannot be known, even though this information is of great interest in determining the landing speed and approach angle of the mudballs, for these might be checked against the general looks of the impact locations in the Carolinas. "We have heuristically and empirically identified the Saginaw Bay area of Michigan as the likely impact [launch] location. At the present time we have yet to identify adequate evidence on the ground to validate the impact identification." "Given the relatively shallow angle of incidence and the hydrated nature of a cometary impactor, the geological signature of the proposed impact structures is unconventional: both shallow and oval. Additionally, the conjecture holds that terrestrial material ejected from such an event would be distributed in a 'butterfly' pattern as a thin sheet whose surface occasionally contains 'Carolina Bay' landforms." These are not different from the analogical suppositions underlying the previous theories. "Analogy is not proof," wrote Alfred de Grazia, "But to humans of all times, analogy must be proof." The "relatively shallow angle of incidence" of the comet, has nothing to do with the "shallow and oval" impact locations. There is nothing to suggest that a low-flying comet would generate shallow oval Carolina Bays. The "butterfly patterns" and the "occasional landforms" are pure nonsense. The "occasional" Carolina Bays number to 500,000 in the Carolinas alone. I am quoting this to illustrate the desperation among researchers in attempting to find causes. Continuing with the logic of Davias and Gilbride, they next claim that the advantage of the "heuristically determined" new location is that loft times for the mudballs are reduced to 6 to 10 minutes, which they consider realistic in that the objects no longer have to be flung into the stratosphere, and would have an exit velocity of about 300 meters per second -- 670 miles per hour (1000 km per hr), 10 times faster than a landing commercial jet. I don't think I can follow any of the math; I'll have to trust them on that. Regardless of the calculations of Davias and Gilbride, it seems that something has been missed. The Carolina Bays are vastly different in size one from another, and represent masses of sand differing by more than 10,000 to 1. These paint spatters were most likely not launched with a uniform force, because the heavier mudballs would have required more lift or would have fallen far short. The different sized mudballs could only land close to each other if their launching force was independent of their mass. That suggests electrostatic repulsion on individual sand grains as the driving force. For this case the acceleration into the air remains the same since the object sizes remain closely the same: they are grains of sand. It might also suggest that sand and water were launched at the same time and coalesced into spherical forms in transit. From what is known of the forms -- that they seldom are much longer than wide, that they do not destroy prior Bays, but simply overlay them -- it should be obvious that a low angle for a final trajectory is out of the question. The 700-mile-per-hour (1000-km-per-hr) landing speed would have smeared the mudballs over miles and miles of terrain. So the simile of a landing jet airplane is just not applicable. The Carolina Bays look more like they fell from almost directly overhead, with very little in forward speed and very little in elevation. They look, in fact, as if they hovered before setting down. The method of achieving a soft landing, which would not disturb earlier Carolina Bays, is to use aerodynamic lift. This suggests, in effect, that the mudballs reshaped in flight into saucers, so that they landed like tossed Frisbees. A sphere has almost no aerodynamic lift, but a rounded (convex) upper surface to a flattened sphere would provide the airfoil and the lift. Understood as Frisbees, the Carolina Bays could very well have flown in at a very low angle before dropping straight down at the last moment. "Settling down" would be a better description of the landings. At this point something needs to be said of the amazing cohesiveness of the mudballs. These would not have survived the landings at 700 miles per hour or a fall from great heights if it were a simple mix of water and sand. I will suggest a consistency akin to bread dough or window putty. At the location of the electric arc, dust from ground-up silicates would spread out after being lifted by repulsive electric field forces. It would spread out through mutual repulsion. Steam vapor reacts similarly, as we see in the formation of clouds under normal conditions. But more importantly, water has a valence affinity for the positively charged dust, so that the water vapor would distribute its molecules to cling to the sands. "When an ionic or polar compound enters water, it is surrounded by water molecules (Hydration). The relatively small size of water molecules typically allows many water molecules to surround one molecule of solute. The partially negative dipole ends of the water are attracted to positively charged components of the solute, and vice versa for the positive dipole ends." Sand is hardly a "solute," except for the peculiar condition in this instance of being positively charged and ground to minute particles. This also happens with clays silted from rock. Clays will hold together as a cohesive mass, capable of holding large quantities of water, but so does bread dough, which is even less plastic. Additionally, the admixture of a very small percentage of bentonite to the sand would increase its mutual adhesion tremendously. This is the difference between sand with which sand castles can be built, and sand which will not hold together. Bentonite is a very fine clay formation, derived from a number of different natural sources, supposedly by wind and wave action. Bentonite will hold many times its own weight in water, and thus promotes colloidal suspensions and sand adhesion. The possibility that the arc created bentonite as well as sand, is likely. "The ionic surface of bentonite has a useful property in making a sticky coating on sand grains. When a small proportion of finely ground bentonite clay is added to hard sand and wetted, the clay binds the sand particles into a moldable aggregate known as green sand used for making molds in sand casting [a foundry process]." "... The same effluvial deposition of bentonite clay onto beaches accounts for the variety of plasticity of sand from place to place for building sand castles. Beach sand consisting of only silica and shell grains does not mold well compared to grains coated with bentonite clay. This is why some beaches are much better for building sand castles than others." Once the mudballs landed, the sand and water mix would start to separate as the negative charge of the Earth's surface neutralized the six-foot layer of positively charged sand and water. The ovoid would slump, the edges would spread and lift from the weight, and a pool of water would filter up to the top as the sand grains were released. The particular sequence here is speculative, of course. It only suggestively accounts for the ridges surrounding the water pools. These can be suggested if the ionic release happened quickly. The raised edge on the southeast side of the Bays in North and South Carolina could, with some fudging, be assigned to the remnant forward momentum of the Frisbee mudballs. The process of hydration and formation into a single cohesive mass takes time, especially in that the mudballs at times were miles in diameter. It is therefore also possible that in many instances this was not accomplished in transit. This failure to coalesce to flying pancakes might result from changing conditions, or changes in the water and sand mixture. Such might explain the fact that in some regions of the USA the elliptical form of Carolina Bay is not well represented, even though axially aligned puddles exist by the thousands. I apologize for presenting so much detail for the model of Davias and Gilbride, but it represents an ingenious attempt at a solution. I accept the Carolina Bays as mudball landing marks (the book of Firestone, West, and Warwick-Smith will suggest something very close to that), but not the other suppositions, which lend nothing of coherent or significant detail to the model and, as I probably need not point out, are again based on an analogy of what was thought to have happened at Tunguska -- a comet on a low incoming trajectory, an explosion in the air, or, in this case, a soft landing of sorts in Lower Michigan, and at that location the spewing forth of sand (assumed as the topsoil) mixed with water, and distributed in a "butterfly pattern" as per Tunguska. An objection to the analysis of Davias and Gilbride is their suggestion of a "butterfly" distribution for the launching of the tossed mudballs. Despite the fact that Davias and Gilbride attempt to relate a "butterfly" distribution to a single particular "impact mark" on Mars, there is simply nothing to back up this notion. Firestone, West, and Warwick-Smith also attempt to relate the Carolina Bays to a few oval craters on Mars and the Moon, but also not convincingly. Not mentioned by Davias and Gilbride is that the "butterfly" distribution first showed up in the literature of catastrophic impacts in an analysis of downed trees at Tunguska by four Russian investigators (Boyarkina, Demin, Zotkin, Fast, in "Estimation of the blast wave of the Tunguska meteorite from the forest destruction," Meteoritika 1964). I would be more comfortable in suggesting that the mudballs could have come from any of the Great Lakes, and certainly from Lake Michigan (which was Davias's and Gilbride's original selection) and from Lake Superior (another obvious choice). The only condition requisite to the formation of mudballs would be the inflow of glacial melt waters as the crust of the Earth was being drilled. At the lower portion of Lake Michigan there already existed Lake Chicago. In addition to the axial lines (of Carolina Bays) pointing to Illinois and Wisconsin, there are a number of extended axial lines, derived initially from Eyton and Parkhurst, which cross (in small groups of two) somewhere in Canada at Hudson Bay, at about 60 degrees latitude. At least, that is the latitude at which all the researchers so far have stopped extending the lines. Eyton and Parkhurst show only three of these lines, and show them for Bays in Southern Georgia and southern South Carolina (Figure 5 of their paper). Firestone, West, and Warwick-Smith show 11 lines extending north to Hudson Bay. But this, as with Eyton and Parkhurst's earlier map, is graphical fakery. It proves nothing except that some lines drawn from North Carolina or South Carolina will cross in pairs at Hudson Bay. Some do not cross, but might cross much further north, some will never cross. If these locations represent sources for the Bays, it should be noted that they are also twice as far away as the lines terminating in Lake Michigan. Firestone, West, and Warwick-Smith use this graphic depiction to suggest additional comet explosions over Hudson Bay. Yet what seems to have been universally overlooked is that all the drawn lines clearly cross all the Great Lakes -- Lake Ontario, Lake Erie, Lake Huron, Lake Michigan, and Lake Superior. These lines do not need to be extended into Northern Canada. All the axial lines point to origins in the Great Lakes. "I have personally seen some of the enormous amount of rock material excavated by glaciers from the Great Lakes that now comprise large parts of thick Wisconsinan, Illinoian, and Pre-Illinoian glacial tills that cover large parts of Illinois and other states." Certainly not "excavated by glaciers," but, all the same, the material is there. So now imagine a spray of material -- boulders and rocks initially and briefly, and then dirt, fine sand, and water -- jettisoned up at a steep angle at the points of contact of 30 mile-wide electric arcs, and spreading out to be dropped to the ground two and more states away from the Great Lakes. Anything falling on the glacier north of the contact points would disappear to future geological analysis. The following quotation from Juergens, on the effects of an arc at an anode surface, comments on the immense destruction at the Great Lakes -- the depth of the bored holes, the disappearance of soil and the underlying rock, the dispersal of this as sand and silicate dust over a large area of North America. The references: : J.D. Cobine, Gaseous Conductors- Theory and Engineering Applications (1958); : J.J. and G.P. Thomson Conduction of Electricity through Gases Vol. 11 (1969); and : E.J. Hellund The Plasma State (1961). The entire process was astoundingly brief. Afterwards the Earth was shrouded by a blanket of fine carbon soot in the stratosphere, which didn't subside for 1500 years. This was the experience of the cold and shadow during the Younger Dryas. When it lifted and light returned, the Earth had drifted to a location somewhere below Saturn. It could thus be suggested that the earlier periods of cold (and glaciation) were due to the Earth sporadically making electric contact with the plasmasphere of Saturn, and possibly Jupiter, which was located much closer to the Sun initially. This offers a clue to the inevitability of what happened in 10,900 BC. The evidence, already brought forward in a previous chapter on glaciation, is that prior to this time the Earth's orbit had been continuously modified over extended periods of time, and frequently abruptly. After every modification, and especially after being bounced or dragged to a larger orbit, the orbit of Earth would probably circularize again rapidly on escaping (in a few years or decades). Of some interest in this respect is a graph of Carbon-14 changes since 50,000 ya, presented in the book by Firestone, West, and Warwick-Smith (also presented with the paper by Richard Firestone and William Topping in 2001). The graph shows repeated data peaks which are mostly ignored by Firestone, West, and Warwick-Smith, except as it might seem to validate their theory of a supernova as the cause for the Younger Dryas incident. The original data is from A.H.L. Voelker, et alii, in 1998. This is shown above, although marked up by Firestone and Topping in their 2001 Mammoth Trumpet Magazine article. What is being presented here is the past Carbon-14 level as a fraction of the current value. 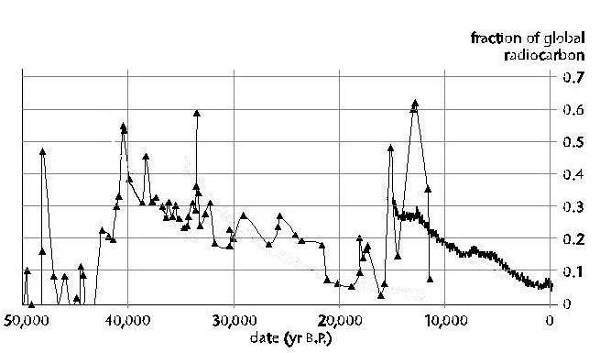 As mentioned above, Carbon-14 excursions (peaks) are shown in the papers by Firestone, the last for 13,000 bp (10,900 BC). Nothing much is made of the date 3000 years before the 13,000 bp "event," and probably little could be made of it, except the suggestion by some that Australia experienced an extinction event. Of course the researchers want to tie the dates of some of the peaks to the arrival times of waves of particles and other things from a distant supernova, but a lot of peaks in the data are neglected. "Such sharp increases in Carbon-14 on Earth can be caused only by a sudden increase in the cosmic-ray rate or by direct deposition of radio-carbon [Carbon-14] from an impacting body." 16,000 to 13,000 ya -- the event before the Younger Dryas, supposedly consisting of a barrage of shrapnel consisting of fullerenes, carbon spheres, magnetic spheres, nanodiamonds, and other things, plus associated radioactivity. "At those times [41,000 ya and 34,000 ya], Earth's magnetic field wavered and almost reversed, meaning the north magnetic pole nearly flipped down to become the south [magnetic] pole." "... Earth's magnetic field flickered briefly, causing the magnetic poles to wander crazily across the planet. The north magnetic pole briefly approached the equator before it recovered." Setting aside the imagined supernova with its three shock fronts, it could be suggested that the events of 41,000 ya, 34,000 ya, and 13,000 ya are simply excursions of the Earth into the plasmasphere of Saturn. In each case the much more extensive (larger and stable) external magnetic field of Saturn was experienced with the result that the Earth's magnetic field attempted to align with this, perhaps somewhat reluctantly because of the remnant magnetism of the crust. Thus with Earth beside Saturn, and at an equatorial level with it, the Earth's magnetic field would attempt to flip, so that its north magnetic pole would be aligned with Saturn's south magnetic pole. In terms of absolute values of magnetism, the magnetic field of Saturn and the Earth are fairly weak, compared, for example to Jupiter. I would not have conceived of an alignment of magnetic fields as an index of where Earth would have been located with respect to Saturn, if it were not for the fact that (as will be pointed out in the next chapter) the later alignment of Uranus to Saturn's rotational or magnetic axis involved only Uranus's south magnetic pole placed directly above the north magnetic pole of Saturn (with Neptune in between). The last entry in 13,000 ya was considerably different from the previous two (41,000 ya and 34,000 ya) where the magnetic field simply tried to turn upside down. In the last instance the field "wandered" and "approached the equator." This could be expected if the Earth was below the equatorial level of Saturn, but still well away from its rotational axis. The Earth's magnetic field would attempt to displace itself to lying horizontally, that is, across the equator. As the Earth turned, the north magnetic pole would "wander." It would seem that the repeated contacts between Earth and Saturn moved lower over the course of some 30,000 years -- at least, in these three instances, and as graphically represented here (and assuming there is some truth in all this). 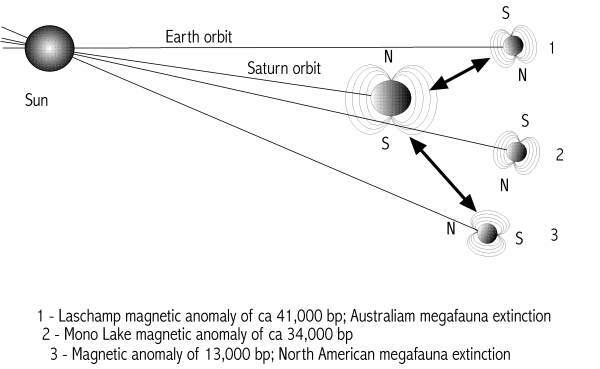 An interesting indication of this is that the presumed electric contact of 41,000 ya in Australia was below the Earth's equator, suggesting that Earth passed Saturn above Saturn's equator. There is no clear record of a land contact in 34,000 ya. But the contact of 13,000 ya, as we know, was some 60 degrees north of the Earth's equator. The passes between Earth and Saturn had progressed, very slowly, from having Earth above the equatorial level of Saturn, to well below. The oldest records brought forward in the Maya Chilam Balam record seven sightings of the "stones" representing God the Father who was attempting to come into existence. Enormous spans of time are indicated between approaches of the stones, although more likely "approaches" should be understood as the time of the leave-takings of Saturn. In the chapter "The Olmec Record of the Past," written long before the current chapter, I had suggested that the Chilam Balam record might go back 30,000 or 40,000 years. I would now suggest that this record starts in 41,000 BC. At that time Australia and Southeast Asia were assaulted (apparently) by an electric field contact with Saturn. The megafauna of Australia and Southeast Asia went extinct, as did the Cro-Magnon living in the west of Australia. If this information could be correlated to glaciation and Ice Age temperatures over the last 50,000 years, it might suggest that Earth was captured and released by Saturn seven times before the last event (the Younger Dryas). The temporary capture meets the conditions suggested by Tom Van Flandern, and also follow his suggestion that such capture could be temporary -- although measured in thousands of years. In each case capture would be initiated with Earth and Saturn near the Sun. Releases would happen under the same conditions. The last interaction with Saturn in 13,000 bp (10,900 BC) most likely represents the time when "things were put in shadow," as stated by the Quiche Maya creation epic, the Popol Vuh. The Popol Vuh promises to give an "account of how things were put in shadow" but never explicitly gets to that. This last contact with Saturn would have happened with the Earth well below Saturn and nearly axially aligned (the axes in parallel), and the Earth's magnetic field, as implied from secondary data by Anthony Peratt, primarily in an up-down direction (see a later chapter for this). The two dates of 41,000 ya and 34,000 ya can be checked against Ice Core Temperature chart and the Italian Bog Temperature chart in the endnotes of a previous chapter. 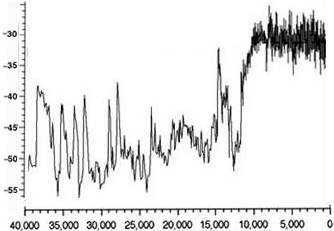 It will also be seen that there are eight sudden peaks in the Greenland ice core temperature after 41,000 ya (shown below), and (on another chart) five Heinrich events (marked H6 to H2) which have occurred since 40,000 ya (H1 at about 13,000 ya was originally not shown), indicating as many Canadian Glaciers skidding into the Atlantic. What does this mean? If, in concert with Firestone, we can only assign three of the temperature excursions to plasma contacts with Saturn, what was behind the total of eight global climate changes, lasting 2000 years at times? Except as speculated above, I do not know. And, except for even stranger speculation, no one else seems to know. The real test would be to find sources for the formation of the various carbon forms and radioactive products, which constitute the data for Firestone and the other researchers, other than extraterrestrial. I had started to do this, but did not complete the listing. Firestone admits other sources for many of the molecular products (high temperature, high pressure, electric arcing), and even lists some which would contraindicate extraterrestrial sources. Then, in 2010 and 2011, claims to a comet impact started being disputed with a series of articles which generally took exception to the supposed comet debris (buckyballs, nanodiamonds). To be implied from this missing or incorrectly described secondary data is that perhaps there was no comet. Nevertheless, all the signs of a massive impact remain. "West is Allen Whitt -- who, in 2002, was fined by California and convicted for masquerading as a state-licensed geologist when he charged small-town officials fat fees for water studies. After completing probation in 2003 in San Bernardino County, he began work on the comet theory, legally adopting his new name in 2006 as he promoted it in a popular book. Only when questioned by this reporter last year did his co-authors learn his original identity and legal history. Since then, they have not disclosed it to the scientific community." That doesn't mean that West doesn't know what he is doing. The problem with this study is not West's hazy qualifications, but the fact that there never was a comet or a comet impact. The critics are pointing that out, and if they have their way, the whole of the climate change at the Younger Dryas, the extinction of the mammoths, the demise of the Clovis hunters, and all the wrong Carbon-14 dates will be thrown out also. Some of the claims quoted at psmag.com as representing the counter arguments, like "the American Buffalo survived," are just astoundingly ignorant for "scientists." These oval forms also appear near Lake Tanganyika in Africa. On molten mountaintops and ridges, see Dennis Cox, who has investigated altered landforms, presented at [sites.google.com/site/dragonstormproject/], and attributed by him to the event at the start of the Younger Dryas. Cox inadvertently adds in the later burn marks due to Mars in the 8th and 7th century BC in northern Mexico and southern USA. See also Michael Steinbacher, "Notes Toward an Electric Catastrophist Model for Geology" (EU 2014 Conference, March 22, 2014, and [www.eu-geology.com/]). I wrote up the effect of an arc (or as it turned out, a series of arcs) at the surmised location of the Great Lakes before checking bathymetric data for the Great Lakes. Seems that my initial guess was correct. I knew that they were deep, but they turned out to be extremely deep, and primarily consist of circular depressions -- looking like bored holes. It has to be suggested that the electric field contact happened during daylight, so that Earth would have been on an outer orbit with respect to Saturn. "Daylight" would account for the interrupted slaughter and removal (sawing off) of a single mammoth tusk which was abandoned at the edge of the ancient waterhole and swamp at the Blackwater Draw archaeological site in New Mexico. The suggestion for this coincidence is related in The Cycle of Cosmic Catastrophes. Bathymetry data for the Great Lakes follows, not shown in correct scale (sizes and depths are listed). All images after [glerl.noaa.gov]. The total time for the series of arcs should have been about an hour under normal conditions, since the locations span about a time zone. But the gyroscopic reaction of the Earth would have brought up the west to move faster than usual toward the east at this latitude (45 degrees north). I have since become aware of nearly the same analysis, but for tornadoes, by Peter Thomson, found at [www.peter-thomson.com/tornado/] and more vividly illustrated. The original data is from a paper by Antje (A.H.L.) Voelker, et alii, "Correlation of marine 14C ages from the Nordic Seas with the GISP2 isotope record: Implications for radio-carbon calibration beyond 25 ka bp" [kiloyears-ago before-the-present] (1998), Radiocarbon v 40. The unexplained dip at 16,000 bp might reasonably be equated with the cold snap of the Older Dryas, thought to be only 100 to 150 years in duration, or more likely with the Oldest Dryas, an ill-defined cold period from approximately 18,000 bp to 15,000 bp. There is no thought of applying electric field theory, or suggestions that the magnetic field would have changed with a change in the magnitude or direction of an external electric field, or for that matter, an adjacent magnetic field. Electric considerations are completely absent from astrophysics. Yet what we have here (in Firestone's book) is the implicit admission that the Earth's magnetic field is influenced by something external. This is generally also not allowed in geoscience. I have seen claims by oceanographers that a Fourier analysis of the oceanic core data accurately reflects the Milankovitch climatic cycles -- the climatic response of the Earth to the inclination of the axis, the precession of the polar axis, the precession of the orbit, and other factors -- all based on current conditions. Fourier analysis is a method of resolving an arbitrary waveform (or time series) into an approximate set of sinusoidal frequencies. "When Fourier analysis was applied to deep-sea records in 1975, it emerged that the oxygen-isotope series contained strong cycles with periods near 100,000 years, 41,000 years, and 23,000 years. These are precisely the periods expected if Earth's orbital elements (eccentricity, obliquity, and precession) govern ice-age climates, as proposed by Milankovitch Theory. Thus, there could be no more doubt that orbital elements had to be considered as important drivers of climate on long time scales." Other researchers are far less convinced. It is as easy to say that evidence for the Milankovitch climatic cycles exists, as it is to suggest that it only might exist. The highs and lows in climatic conditions would have to appear at times equal to the sums and differences of the three cycles listed above. They do not. That is not to say that there are not some very large time cycles involved, but these would, as I pointed out in the text, change over time. In fact, one does not need Fourier analysis to pick the intervals mentioned above (100,000, 41,000, and 23,000 years) from the data. The periodicity can be visually identified, but the intervals only approximate the current estimates of eccentricity, obliquity, and precession. The Fourier analysis also does not explain the series of cold and warm periods of the last 100,000 years and does not explain why all such variation completely disappeared from the data 10,000 years ago. Also left unexplained is the steep slope of the transitions from a cold period to a warm period and the reverse. Size of this page: 21091 words.